DeviceNet™ communication link is based on proven CAN technology.DeviceNet™ is a bus system developed by Allen Bradley (Rockwell Automation). These cables are used to interconnect various industrial devices, such as SPS controls or limit switches. The special characteristic of this bus system is that a data pair and a power supply pair are integrated in one cable. 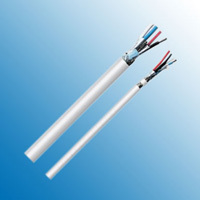 These cables with PVC jacket are designed for fixed installation. 0.20 GOhm x km min.